I discuss the profitability of diversity in an article, “Disregard Diversity at Your Financial Peril: Diversity as a Competitive Financial Advantage,” that was published nationally in the May / June 2013 issue of Diversity & the Bar, the magazine distributed by the Minority Corporate Counsel Association. You can read the full piece at: http://www.theaxelrodfirm.com/mailChimpNewsletters.php?ID=12. Companies with three or more women on the board outperform companies with all-male boards by 60% in return on invested capital, 84% in return on sales, and 60% in return on equity. Among Fortune 500 companies, companies with the most women on their boards outperformed those with the least by 66% in return on invested capital, 42% in return on sales and 53% in return on equity. In fact, the positive influence of female board members is so strong that as the percentage of women board members of Fortune 100-500 companies drop, so does the success of the companies. Women represent 18% (nearly one in five) board members of the most successful U.S. companies, the top Fortune 100 companies. As you move from Fortune 100 companies to their slightly less successful Fortune 200 counterparts, the number of women on the board decreases to 16.7%. Fortune 300 companies have slightly fewer women on the board, 14.9% and so on down to Fortune 500 companies. Less women in leadership equates with less financial success. The most racially diverse companies bring in nearly 15 times greater revenues than the least racially diverse. Racial diversity is a better determinant of sales revenue and customer numbers than company size, age, or number of employees at a worksite, and companies should not disregard other forms of diversity. If you look at IBM, their People With Disabilities Task Force is expected to generate over a billion dollars in new revenues. The reason diversity works is that on almost every measure, greater racially, ethnically, and culturally diverse workplace teams function more effectively than more homogenous teams. Members from diverse backgrounds, experiences, and perspectives avoid “groupthink,” whereas non-diverse teams get mired in it. Diversity not only holds great potential to increase law firm profitability; openness to candidates from diverse backgrounds — for employment, raises, bonuses, equity, etc. — is essential to minimizing a company’s exposure to employment discrimination claims. I defend companies in their employment, commercial, and general liability matters for a living. A great way companies can lower their exposure is by implementing practices to protect against discrimination. In short, the business case for diversity is overwhelming. This perspective is now seeping into the national consciousness. Nicholas Kristof authored a New York Times Opinion piece in close alignment with it. See: “Twitter, Women, and Power” at: http://www.nytimes.com/2013/10/24/opinion/kristof-twitter-women-power.html?_r=0. Since the publication of these works, there have been a number of terrific articles about the profitability of diversity citing to the actual data. For instance, hard data from the Harvard Business Review on women leaders’ effectiveness shows that “at every level, more women were rated by their peers, their bosses, their direct reports, and their other associates as better overall leaders than their male counterparts — and the higher the level, the wider that gap grows …. [A]t all levels, women are rated higher in fully 12 of the 16 competencies that go into outstanding leadership. And two of the traits where women outscored men to the highest degree — taking initiative and driving for results — have long been thought of as particularly male strengths.” See: http://blogs.hbr.org/2012/03/a-study-in-leadership-women-do/?goback=%2Egde_1827_member_5823592442762387457#%21. Similarly, a comprehensive new survey of six hundred board directors (75% of them male) found that women tend to be better corporate leaders. The survey, conducted by McMaster University and published in the International Journal of Business Governance and Ethics, found that the men opted to make decisions based on tradition, rules, and regulations, whereas the women tended to consider the interests of all stakeholders, cooperate, and be more inquisitive. See: http://www.fastcoexist.com/1681690/women-have-better-decision-making-abilities-than-men-make-better-corporate-leaders?goback=%2Egde_50271_member_5824515174337388544#%21. Also, while I cite in my piece to IBM and the Coca-Cola Company as examples of businesses that are harnessing the competitive financial advantage of diversity, I can now also cite RBC. RBC has been focusing on creating a diverse and inclusive workforce and in the past 12 years, generated $58 billion in profits and seen its share price rise 164%! See: http://business.financialpost.com/2014/01/30/moving-past-diversity-rbcs-journey-to-rid-its-upper-ranks-of-unconscious-bias/. The data shows that women and minorities should be fairly and equally compensated and included in representative numbers at all rungs of the ladder including in leadership positions. Many companies could do a far better job of identifying and factoring out unconscious bias and promoting their workforce based on talent. If they did, they would stand to profit enormously for the effort. Companies like RBC, the Coca-Cola Company, and IBM are great examples of companies that get it. These companies are working on rooting out unconscious bias to achieve greater diversity, functionality, and profits. The reason this work is critical is because currently, women and minorities generally face largely unfettered unconscious bias at every rung up the workplace ladder. Only a few make it to the top. The overwhelming majority of those running American companies and law firms are therefore white, non-diverse (not disabled, not openly LGBT, born in this country, Christian, etc.) men. To give you a striking example of the results of our unconscious bias, as Malcolm Gladwell notes in his book Blink, 58% of Fortune 500 CEOs are not just white and male, but white, male, and 6′ or taller. In the US, only about 14.5% of men are that tall. Women and minorities and even white men under 6’ tall are largely shut out of the top management spot of our largest companies. People have unconscious preconceptions about what leaders look like, so far more tall white men are made CEOs than women, men of color, and shorter white men. To see even more unconscious bias, factor in that in the US, only 3.9% of adult men are 6’2″ or taller whereas according to Gladwell, 30% of Fortune 500 CEOs are. “[A] new study in Proceedings of the National Academy of Sciences offers evidence of bias among scientists — male and female scientists alike — against female students. The study was based on evaluations by scientists of hypothetical student applications for a lab manager position, with the application materials identical in every way, except that half of the pool received applications with a male name and the other half received applications with a female name. The faculty members surveyed — 127 professors in biology, chemistry or physics — were told that their analyses of the applications would be used to help the students. And they were asked to evaluate the students’ competence and ‘hireability’ and to consider how large a salary they would recommend and how much mentoring they would offer the student if hired. Female scientists were as likely as male scientists to evaluate the students this way. ABC News showed folks what’s happening by doing this little experiment. See: http://abcnews.go.com/WNT/video/women-endure-surprising-bias-workplace-21186867. Also see this stunning, spot on ad by Pantene: http://youtu.be/kOjNcZvwjxI. Currently according to “The Shriver Report,” one out of three women in the US are living in poverty or on the brink of poverty. See: http://shriverreport.org/a-womans-nation-pushes-back-from-the-brink-facts-and-figures/. Let that sink in a moment. It is an astounding figure. If we took better care of our women and we were treated more equally, we as a country would be doing better. Countries that more equally pay women are more globally competitive. See the graph at: http://genderdebate.files.wordpress.com/2012/10/test2.jpg. 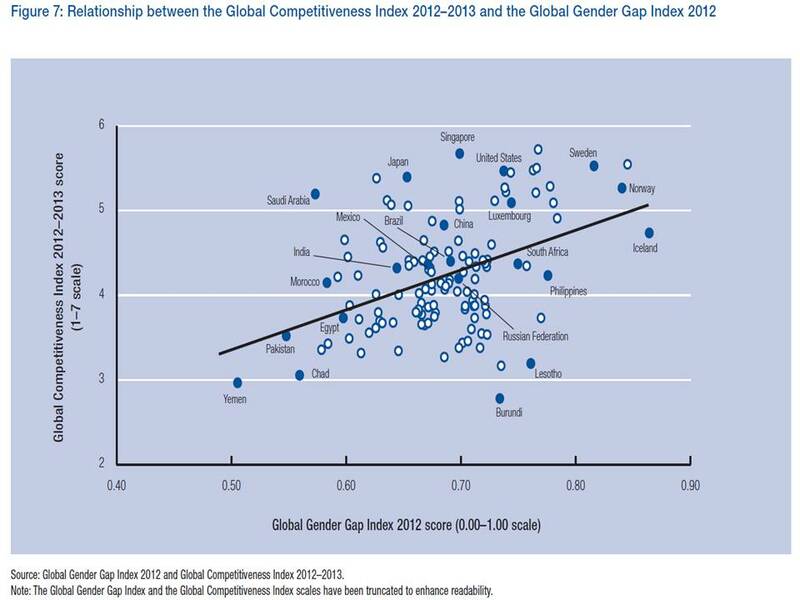 The graph shows that the greater the gender pay parity, the greater the country’s per capita competitiveness. The countries in which women are paid closest to the same as men are the most globally competitive on a per capita basis. The countries in which women are paid the least as compared to men are the least globally competitive on a per capita basis. As John Okray also found in his thoughtful, well researched article, “having women participate at the top of the corporate food chain appears to be a byproduct of cultures that meaningfully value equality and diversity. [C]ountries with more female directors [also] tend [not only] to be the wealthiest [and] most prosperous, [but also the] best educated, least corrupt, and happiest”. See: http://www.americanbar.org/publications/blt/2014/01/05_okray.html. In short, if women and minorities were to achieve pay parity in the United States, the profits of American companies would skyrocket and our country’s global economic competitiveness would increase. We would also by the point of reaching pay parity have improved our educational system, lessened corruption, and become happier as a society. The American Bar Association (ABA) republished “Disregard Diversity at Your Financial Peril: Diversity as a Competitive Financial Advantage” in November 2013 as the Featured Article of an ABA magazine. The National Association of Women Lawyers republished the piece that same month (November 2013), see: http://www.nawl.org/p/bl/et/blogid=10&blogaid=18, and emailed a link to it to all of its members. Sheryl L. Axelrod, President of The Axelrod Firm PC, a five-attorney NAMWOLF law firm in Philadelphia, provides strategic, results-driven advice and representation to companies concerning their general and product liability, employment, commercial, and appellate litigation matters. While only 5% of lawyers are recognized by their peers as Super Lawyers, Ms. Axelrod was not only recognized as a Super Lawyer but rated one of the Top 50 Women Super Lawyers in Pennsylvania for the past two years in a row and selected a 2013 Top Rated Lawyer in Labor & Employment by American Lawyer Media and Martindale-Hubbell.